I visited Delft today and was pleased to notice just the same useful “weeds”there that I am used to finding here in Amsterdam. This tree planter arrangement caught my eye. 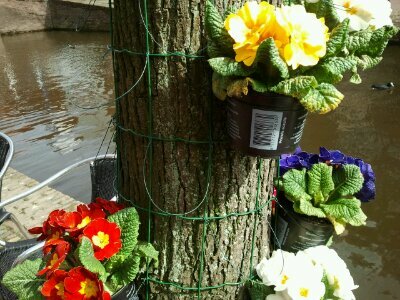 It uses wire mesh and small additional lips pod garden wire, to hold pot plants against a street tree. I’m not sure how the mesh was originally attached to the tree but it now seems to cut into the bark in places which is not at all healthy for the tree. The planted hybrid Primroses could easily be substituted for non hybrid varieties of numerous herbs. And here is one of my herbal plant pots. 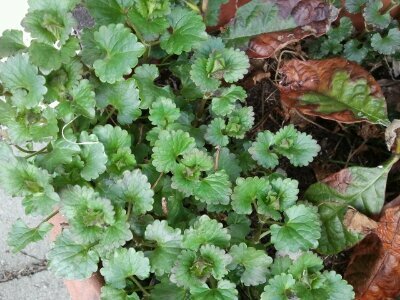 This is a healthy and useful Ground ivy (Glechoma hederacea), growing beside my front door.